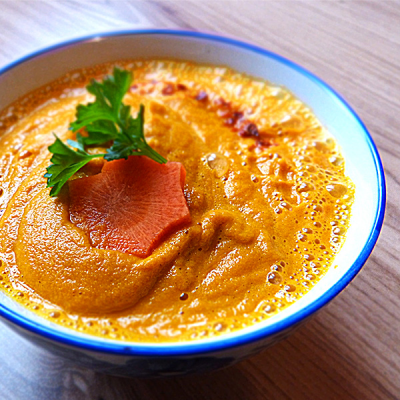 Warming cream soup with truly raw cashews, dried tomatoes, fresh orange juice and spicy ginger. Soak cashews and dried tomatoes in water for a few hours. Chop carrots, spring onions and celery to simplify the blending. Mix those three with ginger, fresh orange juice, sundried tomatoes and the soaked cashews in your blender to get your creamy soup. Season your raw soup with as much curry, sweet pepper and sea salt as you like. Enjoy every moment. Lifefood Tip: For whom the warming effect of ginger is not enough, let the soup blend a little longer, so it warms up. You might also want to use lukewarm water. Made with love. The given amount serves 2 people.